Much like mortgage debt is to home prices, margin debt is to stock prices. With the Dow rising 25% and hitting new record highs every fourth day on average during 2017, borrowings for stock purchases have been hitting new records in tandem. The fear surrounding this trend has been a perpetual worry during this bull market. Sensational headlines sell, but often ignore context. In the real world, it’s common for assets and debt to move together as greater wealth allows increased nominal borrowing. Higher home prices coincide with larger mortgages. The important context is the rate and ratios of risk and return. While margin debt has surpassed another new record at the January peak in stock prices, the net worth of households and stock markets have risen commensurately. In fact, even though stocks are about 45% higher than 4 years ago, the ratio of margin debt (smoothed) to stock market value has fallen modestly. Far from irrational exuberance of excessive debt financed stock market gains, margin borrowings have remained steady. Another way to look at this stock market debt burden as it relates to market risk is the comparison of home mortgages. Obviously, mortgage debt should continue rising in the long term with home values, but in the early 2000s mortgage debt rose at an alarming rate as imprudent risk was encouraged. As long as the cost to service this mortgage debt and those defaulting on their debt are stable to lower, then the current housing boom is sustainable. When the cost of monthly mortgage payments and delinquencies surged from 2005 to 2007, we had significant warning that trouble was near. Over the recent 9 years of economic expansion, home buying has returned with new record levels of mortgage debt as of the 1st quarter of 2018 (estimated). However, delinquency rates continue to fall as the income to service the low interest mortgage debt remains near multi-decade lows. Eventuality higher interest rates will turn all these lines higher and raise the yellow flag for housing, the economy, and the stock market. Similar to mortgage debt, the margin debt in stock market accounts is rising in line with the wealth of the population and the value of underlying stocks. As long as margin debt as it relates to the stock market doesn’t surge too far above previous peaks, it would appear the overbought fear is premature. How high is too high? Given the history of rising debt levels as a percent of stock market values, it’s hard to determine the red line risk level. However, the current 2.3% of the Wilshire 5000 Stock Index value represented by Margin Debt is in line with the norms of the past 2 decades. This presentation is meant to place some of the prevalent debt fears into a calmer perspective apart from the media hype over when the next crash is coming. 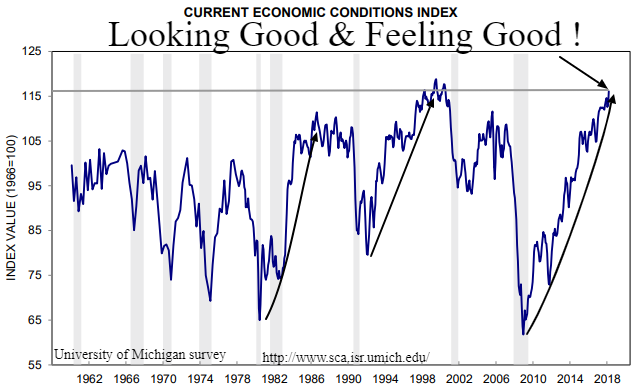 These charts don’t dismiss the possibility of a recession or a paper panic in stocks around the corner. Presidential indictments, trade wars, surging inflation, and the bombing of North Korea or Iran are among many exogenous events that could significantly damage the stock market under current conditions, but none of these or the many historical precursors of a major contraction are currently within view. Major stock market peaks can begin from any margin debt to equity ratio, but current debt levels are not alarming.